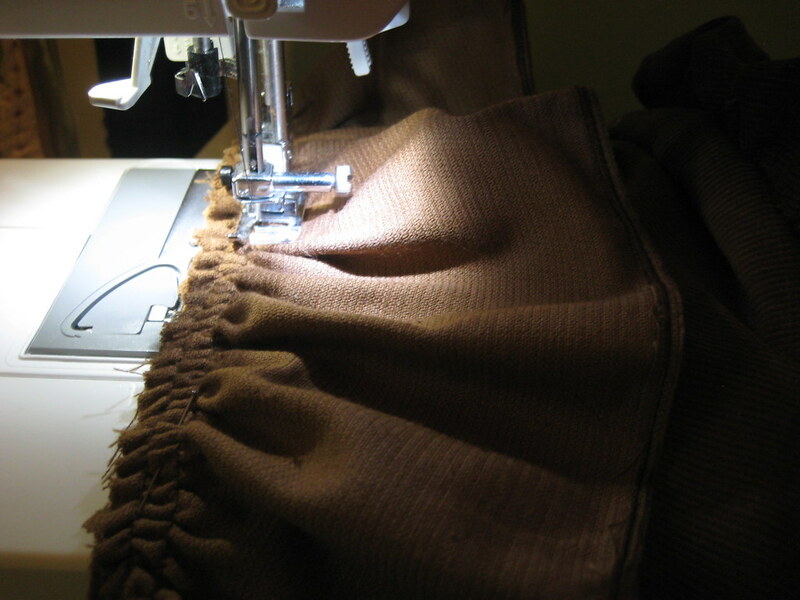 a belated sewing saturday! 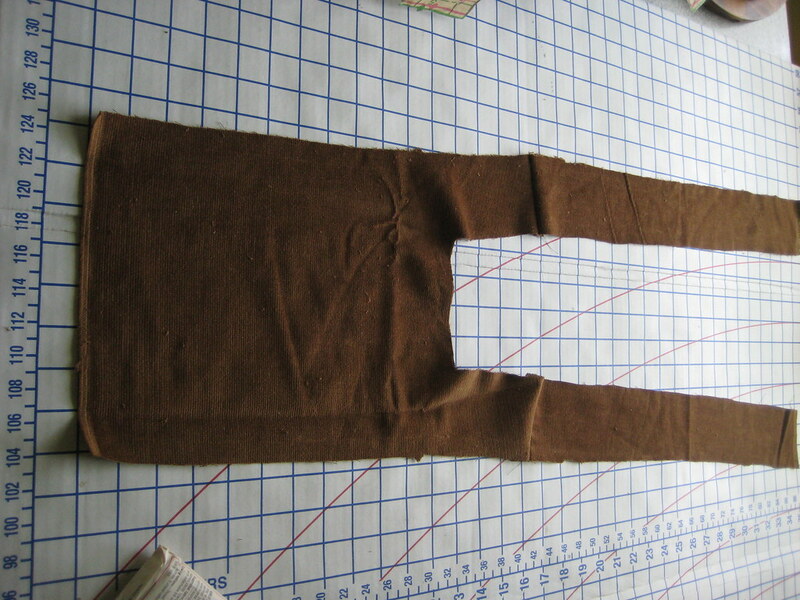 beginning a brown corduroy onesie. 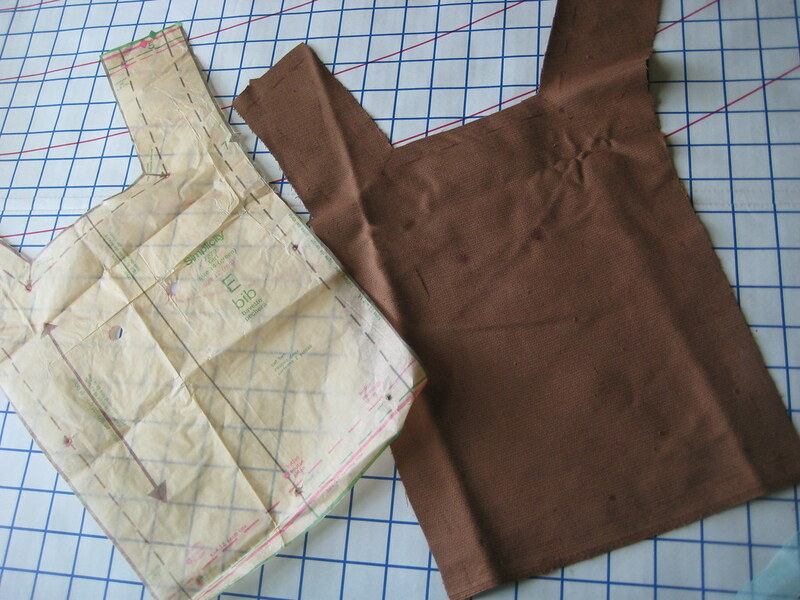 Here is this past weekend's progress I've made on my latest sewing project. 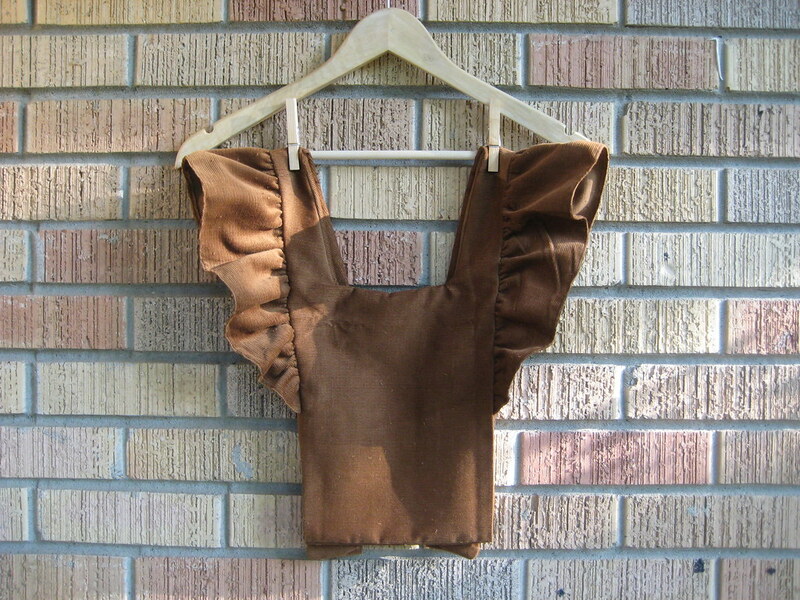 I'm currently in the process of finishing a ruffled bib and suspenders that attaches to matching shorts (which I'm going to add elastic to the legs and make into bloomers). 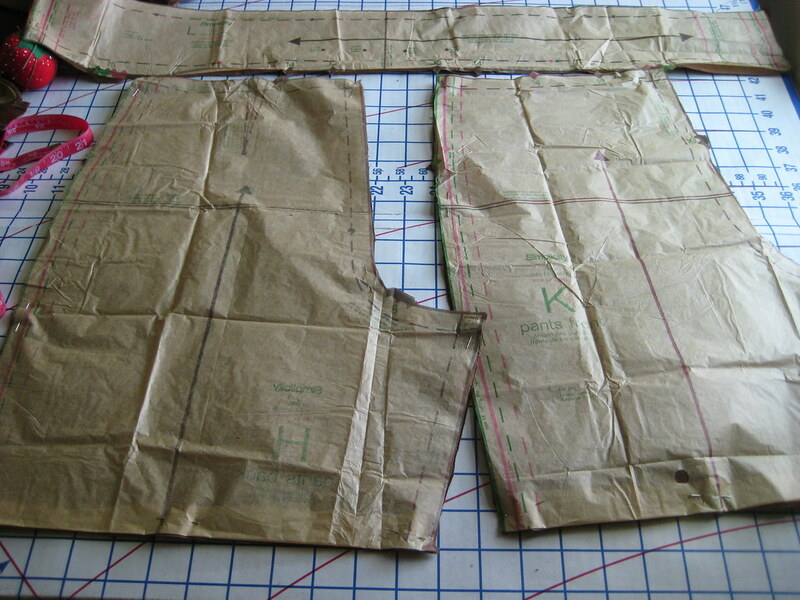 I'll be sewing all of this with black stitching on brown corduroy. The pattern I used is an old 1970's Simplicity pattern with embroidery transfers, which I found at a thrift store in Greenville. 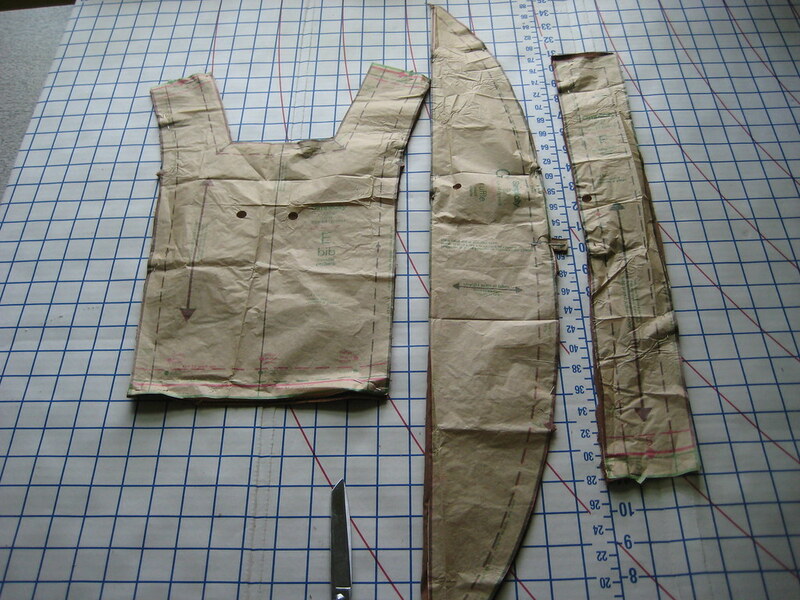 I chose the pants over the skirt and then shortened the legs of the pants pieces to the decided length. 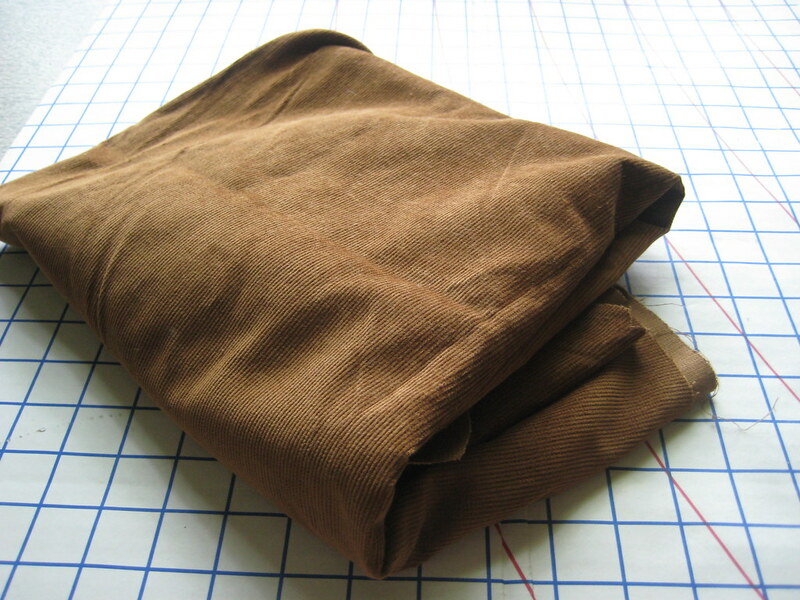 The brown corduroy fabric was found at Goodwill on half off day, so two yards were less than two dollars! It's lightweight enough to be perfect for a summer outfit. 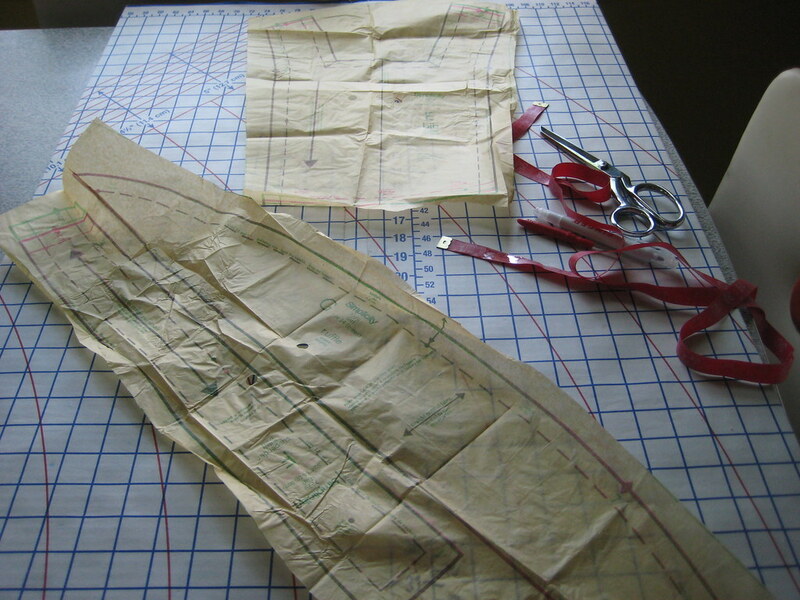 I started with the usual steps.. cutting the pattern pieces, pinning them to the fabric, cutting them out, and marking the pieces. 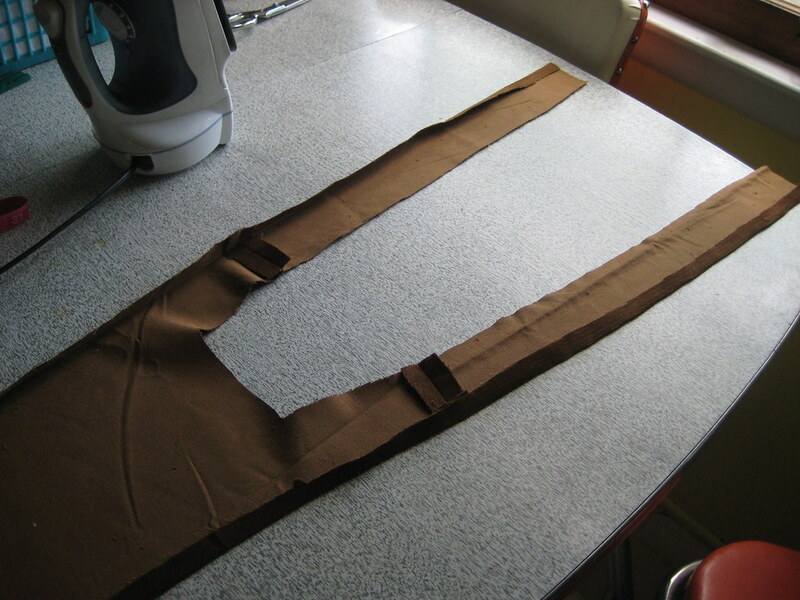 I then sewed the suspenders to the bib and facing, making shoulder seams. After I finished this, I sewed two lines of stitching (one at the 5/8 inch seam allowance, one about 1/4 inch inside the allowance) across the curved part of the ruffle with the intention to gather the ruffle by pulling the fabric downward over the stitches. 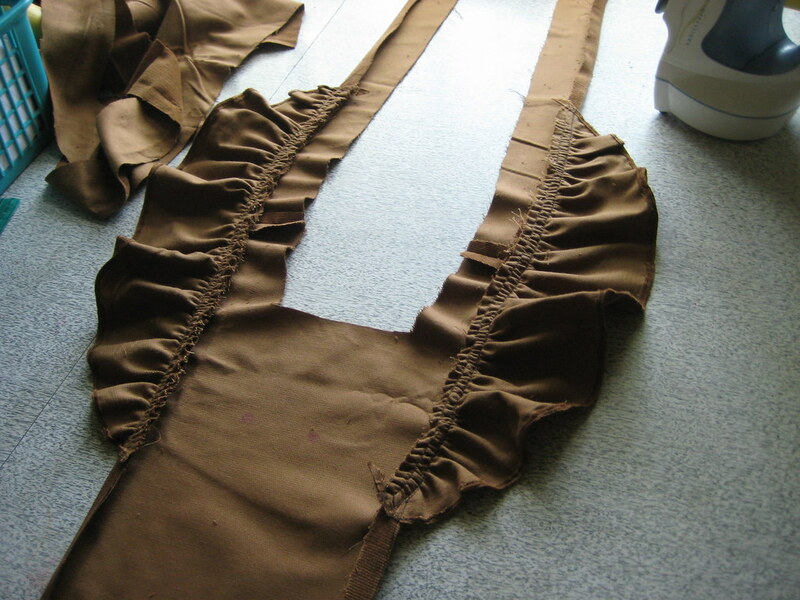 I then finished the other edge of ruffle by 1/4 inch. 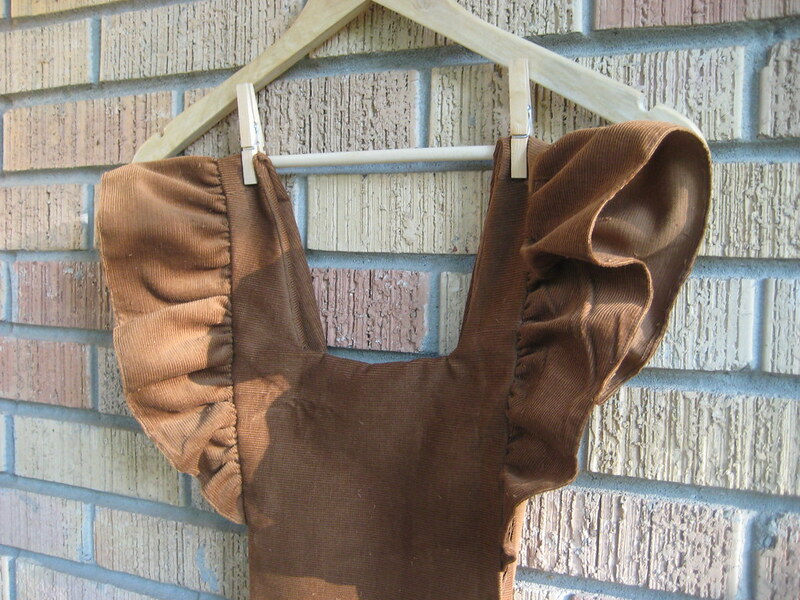 After the ruffles had been gathered, I pinned them to the front bib. 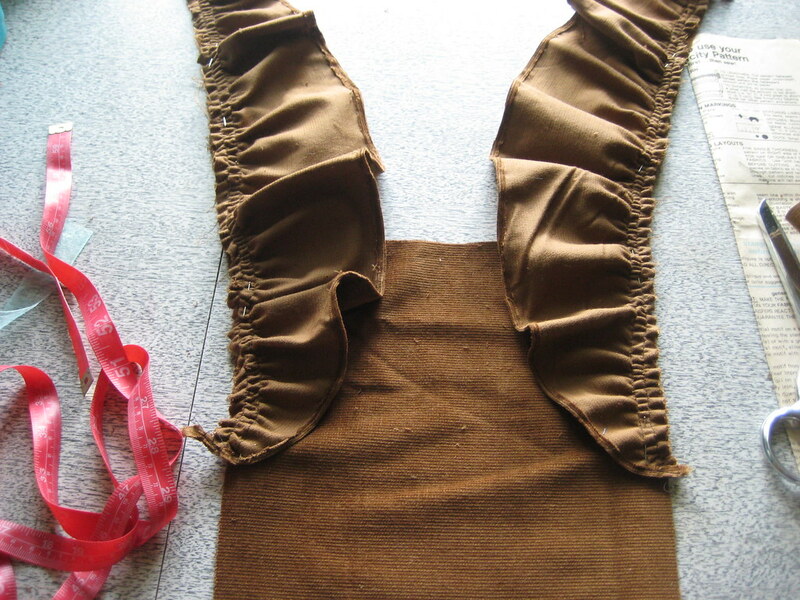 I used the shoulder seam as a halfway point for the ruffle. 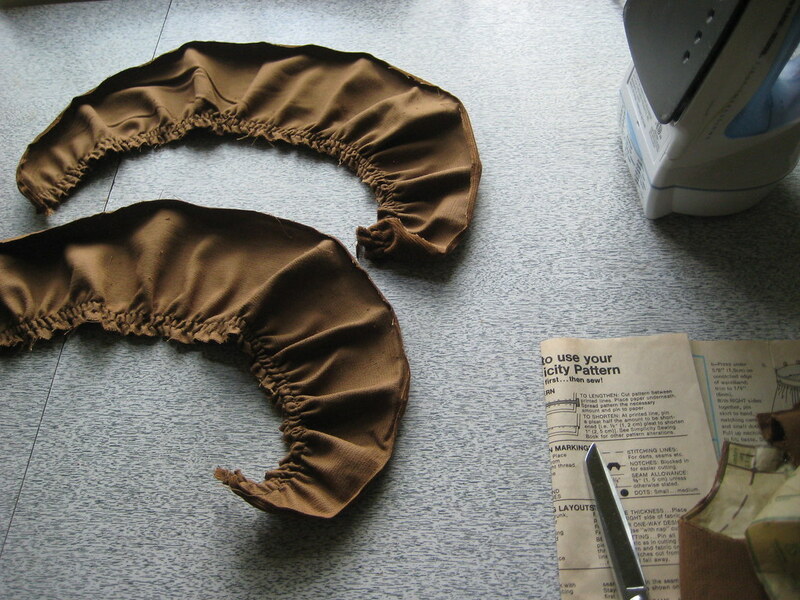 Then, I sewed the ruffle on at its seam allowance. 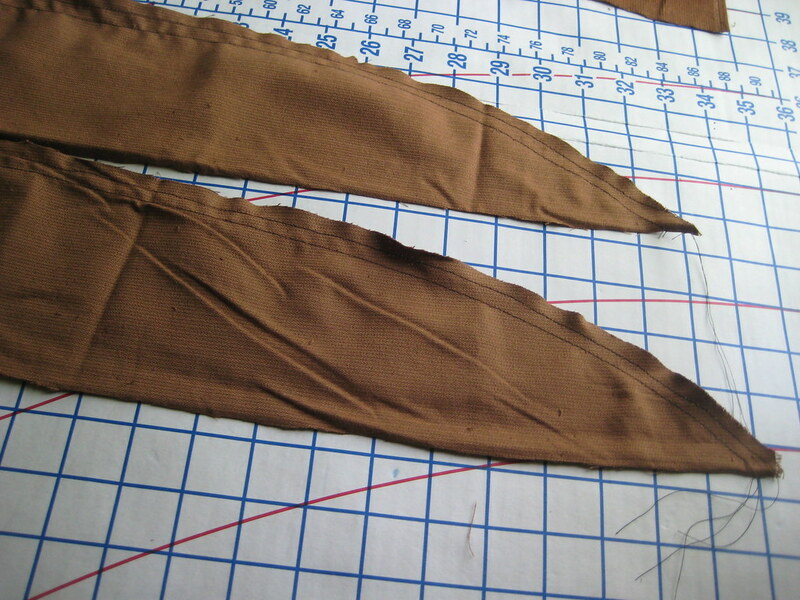 The next step was to stitch along the seam allowance of the sides and bottoms. 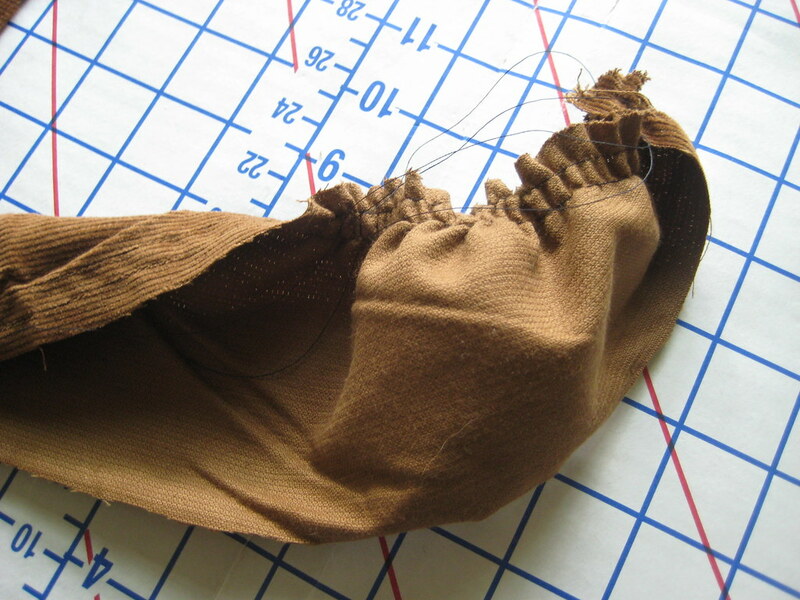 I pressed the seam allowance inward, intending to sew the bib and facing to each other. 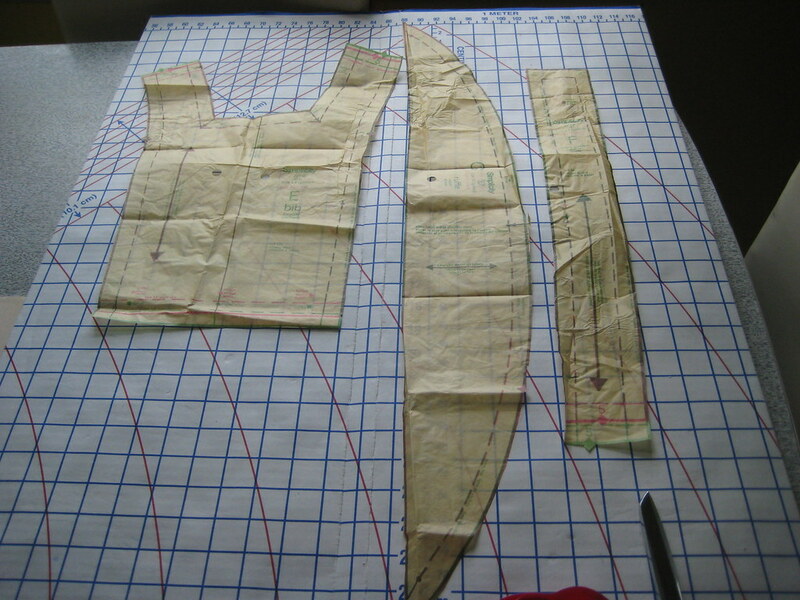 Once the seam allowances had been pressed, I put the bib and facing together, right sides matching, and sewed the bottom edges, neck, and inside and top of suspenders. I turned the bib inside out and pressed it. That's where I am now! 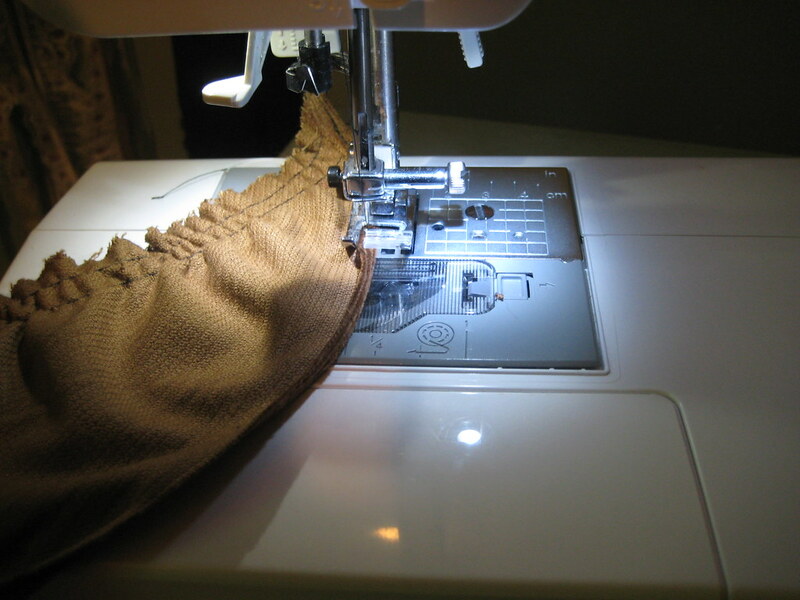 I still have a bunch of steps to do, like making the shorts, sewing on buttons to the suspenders and bib and sewing elastic cord to the waistline of the shorts to keep the bib attached at the buttons. 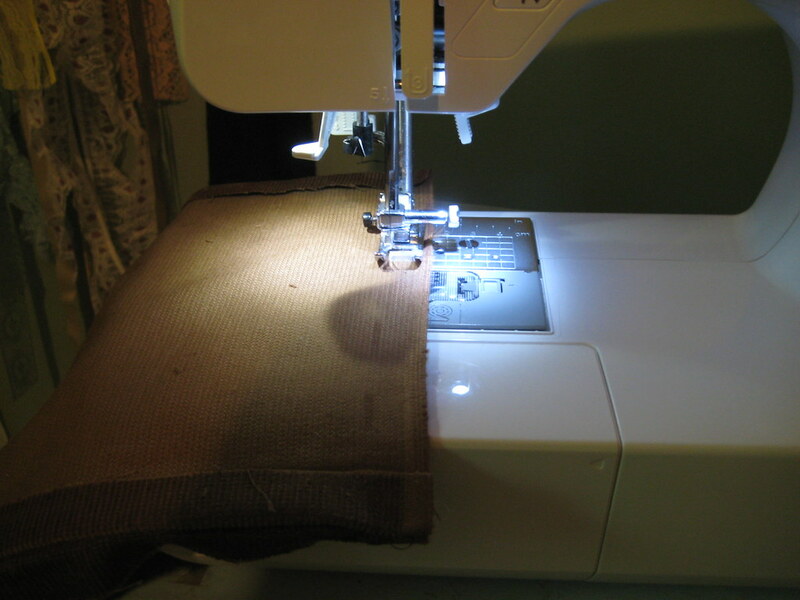 I also have to sew the sides of the bib together. 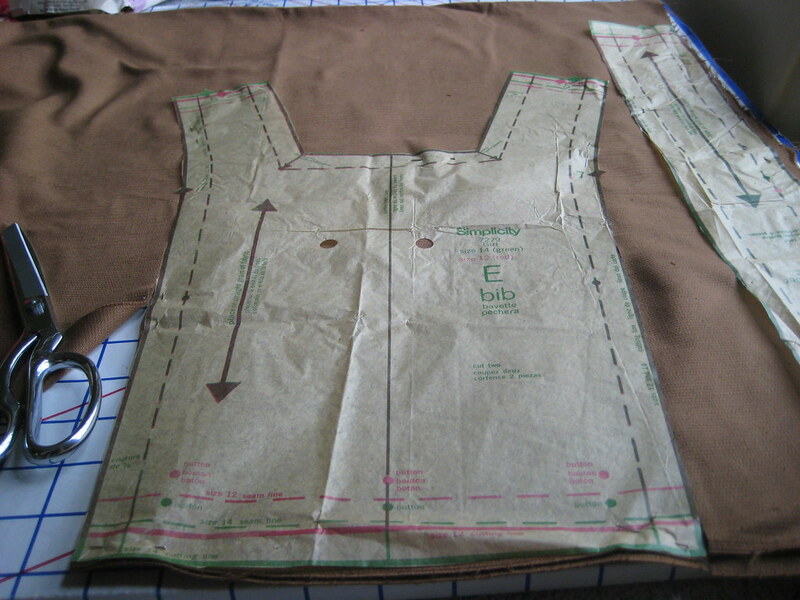 The pattern suggests slip stitching and top stitching the sides, which I may do, depending on how lazy I am. This project has been more time consuming because of my vanishing marker. The new marker I bought, which worked wonderfully on the chambray bloomers, has a habit of vanishing when I use it on the corduroy fabric. I marked everything just to come back to it about an hour later and see no markings at all. I don't know if it's the fabric or the humidity, but seeing as marking is probably my least favorite part of sewing, it wasn't much fun to redo it a few times over. Yuck. I've now gotten into the habit with this project to mark immediately before I sew. 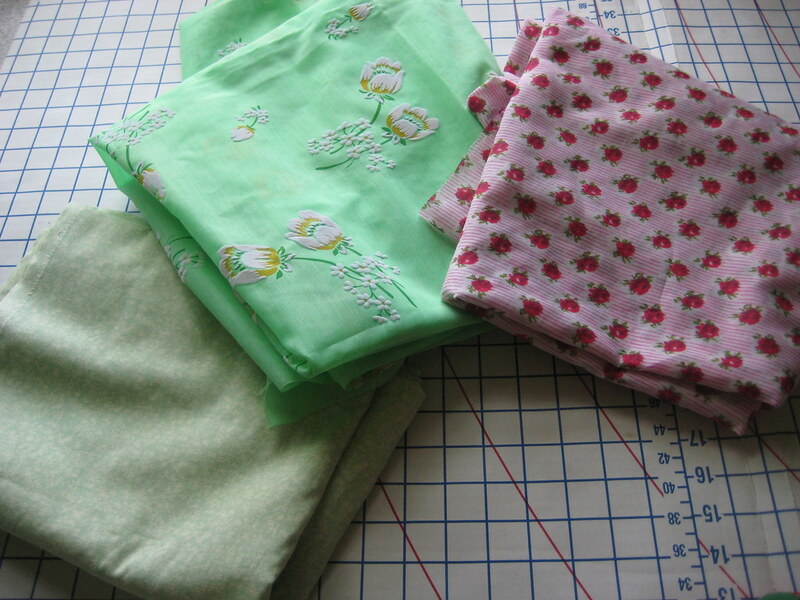 Here are three vintage fabric purchases I've made recently, via Etsy! 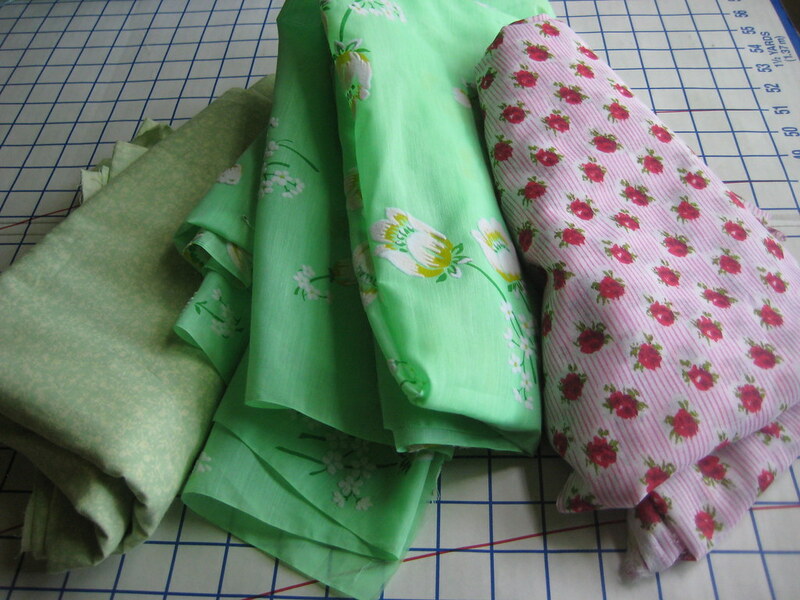 I've got three yards of the subtle liberty print, two yards of the seafoam green flocked floral, and two yards of the striped red rose floral. All of them are cotton or a cotton blend.. the liberty print is a bit stiff, but the other two are semi sheer and lightweight. 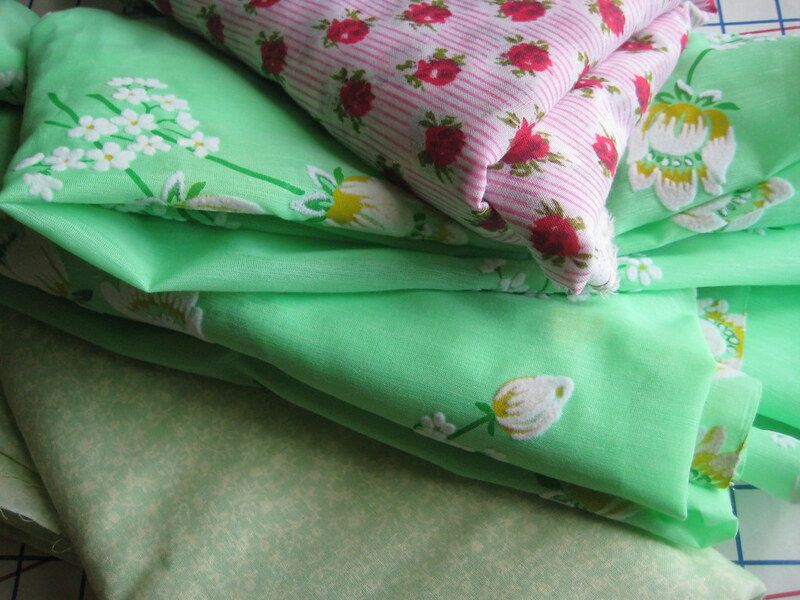 I love them all, but my favorite has got to be the green flocked fabric. When I pulled it out of its packaging and unfolded it, I knew I wouldn't find a fabric like it again. The yellow and white flowers are gorgeous and have a fuzzy feel to them, while the green fabric is my favorite kind of shade. 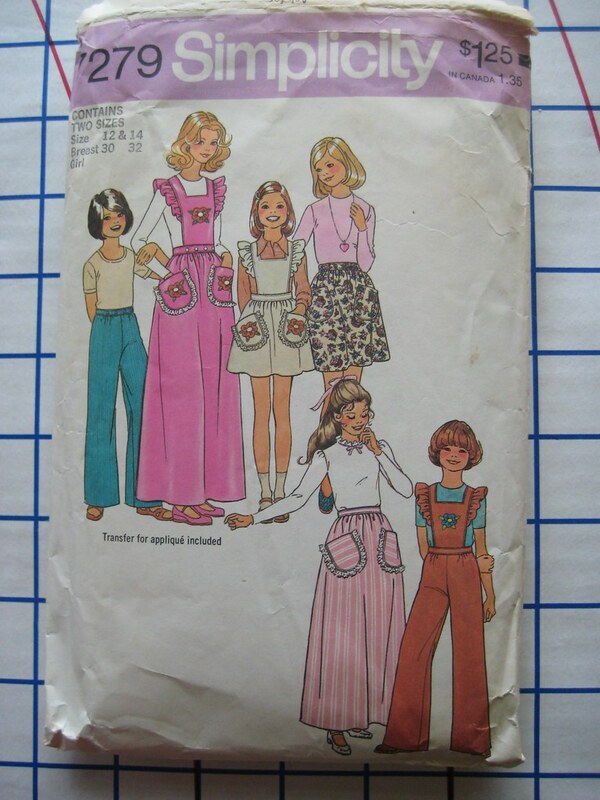 Even with receiving all of these great sewing patterns recently, I can't make a decision on what to use this fabric on. I know it has got to be a ruffled sun dress of some sort, maybe like this one or this guy, but I can't commit. I think I'd rather just stare at it all day. Maybe this pattern? How about this one? What do you think? I've been watching crappy 90's movies all day. I finally had to just turn off the television, open the front door, and listen to my neighbor playing guitar in his backyard. I wonder where my time goes during the day.. then I realize the reason that I've spent the last five hours on the same blog post is because my attention is divided between cheesy movies, internet browsing, phone calls, and this. I need to learn how to focus. Is there ADD medicine for adults? Because if there is, it has my name on it. I swear, PBS has it right. Multitasking will be our downfall. I don't know how to do just one thing anymore. And the very last of my ramblings.. the vintage faded blue denim dress is up for grabs in the shop now! my one year blog anniversary, bloomsday, and a giveaway! etsy update.. tea party florals and lace.